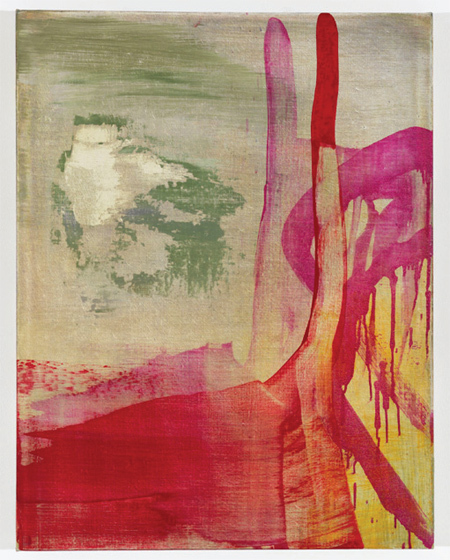 Cheim & Read is pleased to announce an exhibition of paintings and works on paper by Bill Jensen. The show is accompanied by a full-color catalogue with an essay by David Hinton, a prominent scholar and respected translator of Chinese poetry. This is Jensen’s second show with the gallery; his first was in 2007. Bill Jensen was born in Minneapolis, Minnesota in 1945 and received his MFA at the University of Minnesota in 1970. He has lived and worked in New York since the early 1970s, maintaining a studio in Williamsburg, Brooklyn. Jensen has long been respected for his unconventional abstractions, their compositions evocative of otherworldly landscapes where spatial definition is informed by structural logic. Shape, line, and intense color follow unpredictable paths, but coexist in psychic harmony. Influence of the early American modernists (Albert Pinkham Ryder, Arthur Dove) and the Abstract Expressionists (Jackson Pollock, Mark Rothko, the prophetic Arshile Gorky) are evident, as are the visionary canvases of Myron Stout, and Forrest Bess. Jensen is also inspired by Taoist philosophy, Chinese painting, and ancient and contemporary Chinese poetry. The third and fourth century Taoists believed that pure nature could not be experienced by humans, due to their inevitable mannerization of the natural world. Chinese painters subsequently attempted to depict the phenomena of nature “itself.” This history, linked to the idea that all matter is the same-the understanding that something is everything and everything is something-was of profound influence on Jensen. An intuitive, unpretentious painter, Jensen strives to attain content originating in the psychic and emotional; for him, content is more important than result. Jensen argues that his paintings’ beauty, or lack thereof, is not his decision, but determined by the painting itself. The recent paintings on view in this exhibition show the range of Jensen’s process and the depth of his content, from ethereal, washy forms, to dense, physically worked surfaces of color and texture, punctuated by titles like Genesis, Time After Time and Occurrence Appearing of Itself. Saturated red, blues and yellows coalesce, extending in and out of space, retreating and aggressively reappearing. The drawings and works on paper, some black and white, are more intimate in scale, but still contain the translucency and intensity of the paintings. The black and white works, with their variety of tones, read as if they were in color, while the color drawings radiate hypnotic clarity. 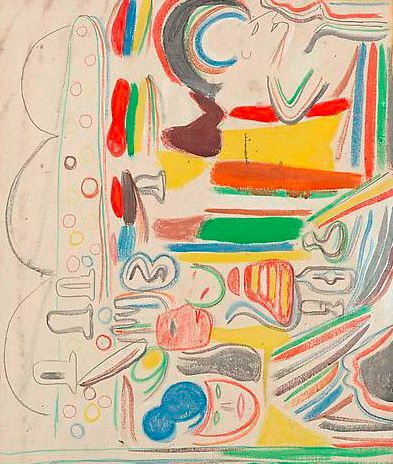 Drawing has been a constant throughout Jensen’s practice, and was at times his main mode of artistic exploration. Its direct relationship to his painting is evident. The sense of freedom in Jensen’s work is belied by the commitment, consistency and seriousness with which he approaches it. As he says, “Each work for me is not about one idea; it is about an emotional event that must be searched for and clarified.” Jensen achieves his goal of transforming the viewer’s experience, providing a peek into the transcendent. Cheim & Read is pleased to announce an exhibition of abstract sculpture by multi-media artist Jack Pierson. Pierson’s last exhibition with the gallery was in 2006. Most recently, his show, “Abstracts,” was on view at Centro de Arte Contemporáneo de Málaga, from June 19 to September 27, 2009. Jack Pierson was born in 1960 in Plymouth, Massachusetts, and graduated from the Massachusetts College of Art in Boston in 1984. He works in several different mediums, including photography, video and sculpture, and is well-known for his re-appropriation of commercial signage and large-scale vintage lettering, with which he creates evocative word-sculptures and installations. 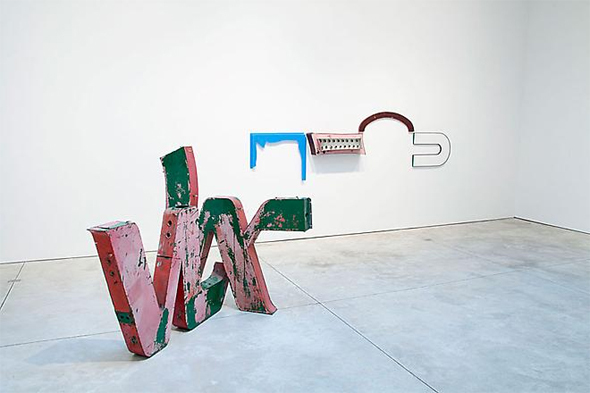 For this exhibition at Cheim & Read, Pierson presents recent sculptural abstractions using his trademark signage materials. He repositions letters and other signage details – broken pieces, numbers and symbols – so that narrative is no longer recognizable. By removing the hierarchy of language, and therefore its immediate associations, Pierson strives for universality – the sculptures do not rely on words to communicate, instead provoking a more visceral reaction. Pierson’s work has long embodied sensations of nostalgia and melancholia, memory and loss. The distinctly American nature of the signage he uses references road-side ephemera and American cultural symbolism, and is imbued with poignancy and disillusionment. 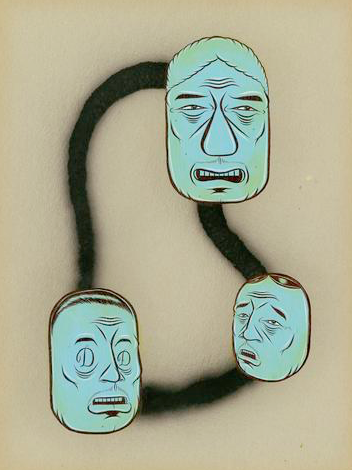 His work is also inherently autobiographical, balanced by a sly sense of irony and humor, which allows the viewer to identify with his imagery. In his sculptural abstractions, the emotional sensibility of Pierson’s style remains, but his themes are less explicit. The work is intentionally non-objective and non-literal – a given word might still exist in a pile or hang reconfigured on the wall, but its signification is diffused. While Pierson’s abstractions are inevitably related to his “readable” word-sculptures, they attempt to move beyond a singular interpretation. He questions the construction of meaning by deconstructing the viewer’s search for it.